A bridge — a device used to replace missing teeth. 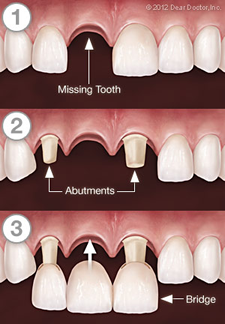 Attaches artificial teeth to adjacent natural teeth, called abutment teeth. Bridges are either permanently attached (fixed bridges), or they can be removable. Fixed bridges are typically cemented to the natural teeth next to the space left by the missing tooth. A pontic (false tooth) replaces the lost tooth. Crowns are cemented onto the natural teeth to provide support for the bridge.